The first sunny days are warming up the soil of Giverny. In Monet’s gardens, the bravest flowers are popping out, most of them discreetly. Their bright petals make little dots of colors on the still bare ground. Pansies, snowdrops, crocuses, dwarf tulips and the first jonquils are a joy to look at. Among all these planted flowers, the eranthis impress by the carpets they make. Winter aconites are able to cover a curve of the pond bank, a nice place that will soon be shaded by tall trees. The eranthis is in a hurry because it needs to bloom, go to seeds and renew its food storage in its bulb in no time, that is to say before the leaves of the trees over it become too big. When the sun can’t shine through anymore, the leaves of the eranthis dry up and die. But not the plant itself! Life is stored underground, waiting patiently for three seasons to pass. 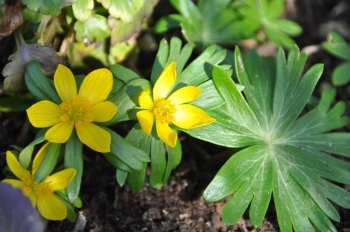 Then, in February, the new shoots of eranthis appear, followed by the lovely yellow flowers in March, like miniature suns emerging from an interesting foliage. But with this plant the motto is ‘love it… and leave it alone’ because it is poisonous, just like the common aconite.